As transport of automobiles between Europe and U.S. increased, vessels with some stowage space designed for cars were launched. Those vessels at the time were called "car bulkers," and could transport bulk cargo as well. Movable car decks were installed so these ships could transport automobiles on outward voyages and bulk cargo such as grain on the homeward leg. At the time, these combined carriers were considered the epitome of transport efficiency. Automobiles were loaded and unloaded by the lift-on/lift-off (LO/LO) system, which used onboard cranes. Development of the roll-on/roll-off (RO/RO) system made loading/unloading operations much faster and resulted in much less cargo damage than with the LO/LO system. It was a completely new idea - just drive the cars on and off the ship. 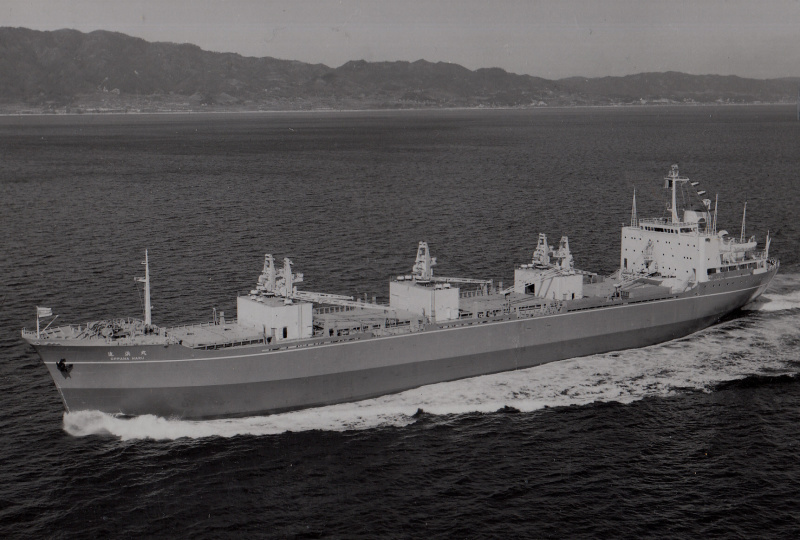 In 1965, MOL launched the Oppama Maru, which was equipped with Japan's first RO/RO system loading/unloading equipment specifically for automobiles. Cars could be loaded at a rate of 100 units per hour, drastically shortening loading/unloading time and greatly reducing cargo damage. Rampways for stowage were placed at the stern and center of the vessel. The Oppama Maru, which set the stage for today's specialized car carriers, represented a new era in automobile transport technology. The Oppama Maru reflected a new approach - designing and developing a ship for a specific mission, and meeting the challenge of future demand. Capacity (small passenger cars): 1,200 units. The Oppama Maru featured a five-deck and six-stowage layer structure. It also had an ingenious technology called a "car lifter," allowing perfectly lateral movement of cars loaded from the elevator with a system of rotating pipes. This made it quick and easy to move vehicles in the narrow space available. The vessel could be used as a bulkship when the movable car decks were lifted up. It had a capacity of 15,000 tons of wheat or other grain. It was equipped with cranes for loading/unloading bulk cargo. Collection of late Hans Harms. Bought with copyright. I believe you are wrong. The Oppama Maru was designed as the first Ro/Ro vehicles carrier and not first as a bulker. Thanks for sharing! Does she wear MOL colours? The funnel looks to be different. Shipbuilder’s sea trials, PR photo? Nice shot and a very,very good description!! Thank you very much my friend.Cheers,Volker.